Our team has put a tremendous amount of time and effort into developing an efficient and affordable plan for the Litchfield Fire Station. We understand that you may have some questions about the project and how it impacts you as a Litchfield resident. Here are some Frequently Asked Questions about the project. Please email Chief Fraitzl if you have other questions that we can answer for you. Q: Why is the new station needed? A: Our station has exceeded its lifespan and functionality by many measures. The current facility, which was built by volunteers nearly 60 years ago, has structural issues, code violations and lacks the space necessary to adequately serve the Town of Litchfield as a whole. Litchfield’s current population is now 12 times what it was when the current station was built nearly 60 years ago. As our town continues to grow, the limitation of this undersized and outdated station impacts our ability to respond to emergencies in our community. More space in a more centralized location prepares us well to handle recent and future Town growth. 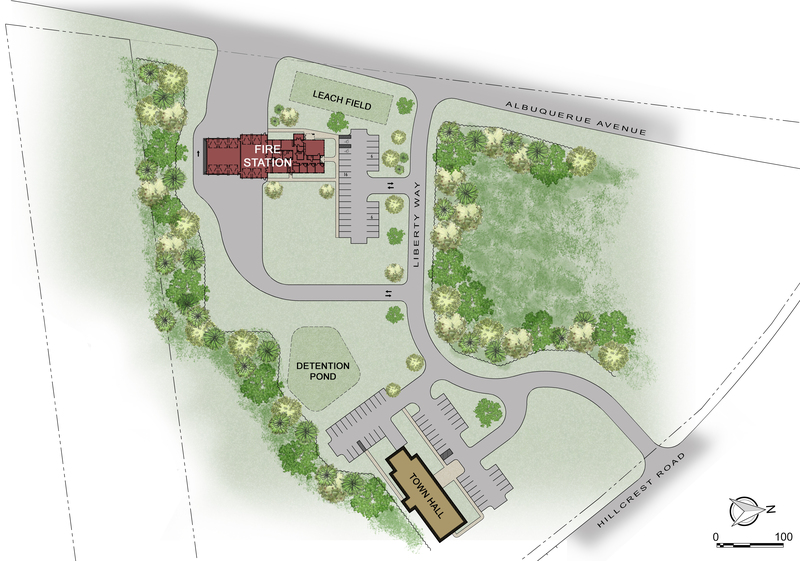 The current facility forces us to leave apparatus outside – the new proposed station would provide sufficient space to house our apparatus and vehicles. A new station may also attract new volunteer and professional firefighting personnel. Construction costs also continue to escalate, and bond rates are still relatively low, so building sooner rather than later will likely save the town money in the long run. Q: Why not add to and renovate the existing station? Our team did explore several building concepts that would encompass adding and renovating to the existing space. An addition to the rear would be most accommodating to new apparatus, but would not have done much for expanded administrative space. Additions to the front or side of the building would have compromised space for parking and storage. Building up was not considered because the current structure is not equipped to support additional loads. The current site is not considered optimal for providing coverage throughout the town and the site itself presents barriers to expansion. Adding on and losing parking would be particularly difficult to accommodate. Layout and traffic patterns on the parcel for emergency access was also a concern. Furthermore, the property backs up to an existing wetland and the buffer restricts building on the back 50 feet of the lot. Q: How does the station’s location factor into the decision? A: The existing fire station is not centrally located within the town and only provides immediate access to Route 3A, or Charles Bancroft Highway. A new facility, at the proposed new location, would improve our response times to the areas where we typically see the highest call volumes. The new location would also not bother residential streets and neighboring homes. 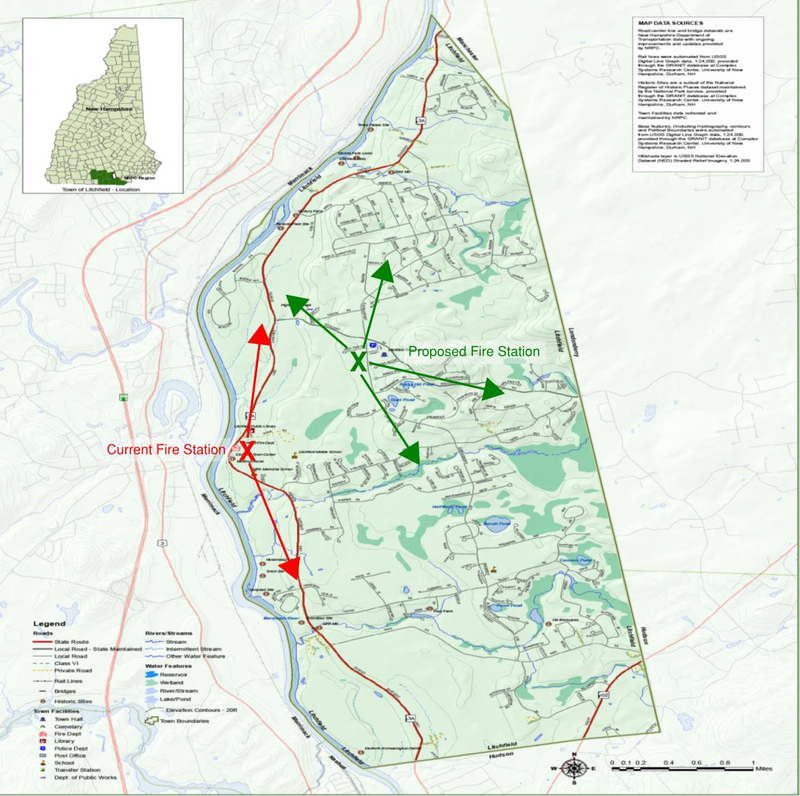 Map of Litchfield and locations of existing and proposed fire stations. A: We are currently completing design and we will provide cost information once it becomes available. Q: How will fire department operations be impacted during construction? A: The existing fire station will continue to operate as normal until construction on the new facility is completed. Once complete, the fire department will move its personnel and operations into the new facility. Q: Where and when can I vote on this project? A: You can cast your vote during the Town Vote on March 13, 2018. Polling location is Campbell High School.